Paul Mattek from Design Fugitives presenting his design for sanctuary art / furnishings between services last Sunday. See below for update. First was worshiping together as a family at Table Rock Lake at a picnic table as we read a Psalm, discussed it, prayed, and sang in a beautiful place surrounded by God’s creation. Second was taking in a production about Moses and getting a tour backstage at the Sight and Sound Theatre which is an absolutely incredible facility in the Ozarks. They did an incredible job making the Bible come alive. And what impressed me very much was how clearly the message of Jesus rang out during and at the end of that production! Taking in the whole scene with the Passover meal as they portrayed it was powerful. This coming Sunday at Victory of the Lamb, Pastor Bill will wrap up our section on Intimacy and Purity by talking about the blessings of a single life. I appreciate the positive feedback you’ve given about this part of our journey through 1 Corinthians. It hasn’t been easy putting together these messages but it’s helpful to hear that many of you have appreciated them and found them to be timely, tactful, and truthful. Click here to watch my message from this past Sunday, “What’s love got to do with it?” Part 3 of our mini series–Intimacy and Purity–as we’ve been going through 1 Corinthians 5-7. During Sunday’s sermon I shared that I put together a list of resources related to some of the topics we’ve been unpacking in this “Intimacy and Purity” section of 1 Corinthians. Here’s a link to those resources. Series Q and A This Sunday – If you have any questions from our current series topic, go ahead and email them to me ahead of this Sunday. Or you can text me your questions Sunday after Pastor Bill’s sermon on singleness. I’ve built into our service for Sunday a Q and A opportunity where Pastor Bill and I will address a couple of your questions. If we end up having more good questions than time allows this could open up the door for another conversation too at a different time. Victory Kids – Victory Kids will continue with regular children’s programming at both services again starting on Sunday, September 11. If you have any questions, contact our Victory Kids Director, Liz Scheel. Student Assistant Peter Schlicht – Sunday we installed our new student assistant from the Seminary for the next 9 months. Along with Peter we also welcomed his wife, Rachel. Last year Peter lived and served as a vicar in Rockford, MI. Peter’s position at VotL has been crafted with his gifts in mind along with where those gifts can best be used now that Pastor Bill is on the team too. Therefore, Peter will be doing some preaching but less than Caleb Schultz did last year. Peter will serve often as a teacher in Victory Kids. Also in coordination with Liz, our Victory Kids director, Peter will lead and develop a youth band made up of some of our church’s teens to help lead the Victory kids in a song that they would then sing in church every other month with the teen musicians leading the music. 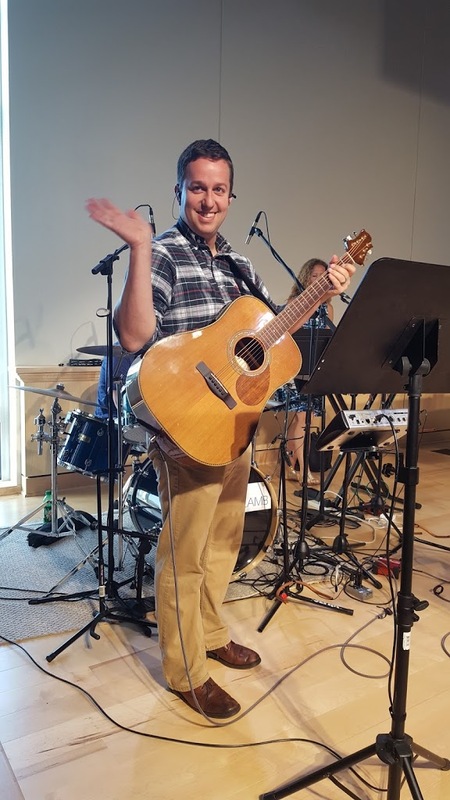 Peter will also work with Sarah Kuerth, our Music Team leader, to integrate with our worship band playing guitar, worship leading, and mentoring especially a couple of our young guitarists. As time permits Peter may also teach a Teen Bible 101 class and fill in wherever else it might be mutually agreeable. 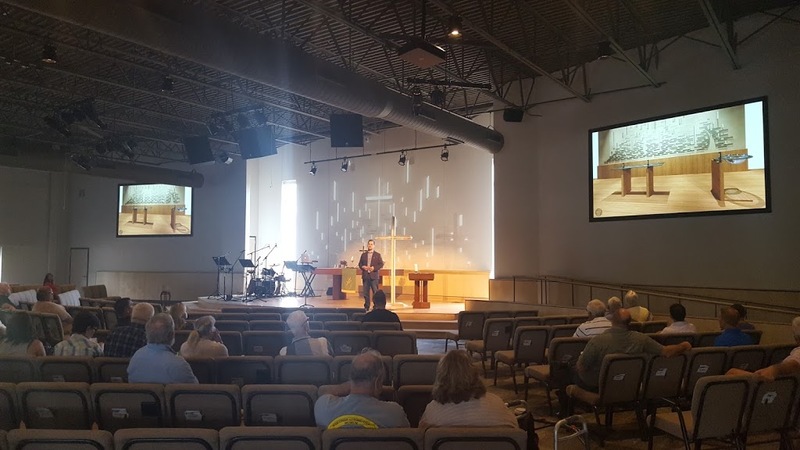 Sanctuary Art and Furnishings – Paul Mattek from Design Fugitives presented his design for sanctuary art and furnishings this past Sunday, August 28. He described the design process and the meaning behind the art elements. Thank you to the many of you who participated and gave feedback! Visit our web page for more details to yet give feedback via a web form. The form will remain active throughout this Labor Day Weekend until Tuesday, 9/6. Paul and I will be meeting soon to discuss feedback and what our next steps are. We may be in a position for the Leadership Team to make some decisions at our next Leadership Team meeting coming up on September 12th. We will continue to update the web page with details as we move forward. August Leadership Team Update—Printed copies of this month’s update from our August 8th meeting will be available at the info tables in the lobby. It will also be available online soon on the page where all of Leadership Team updates are made available. Confirmation Class (6th-8th Grade) Starting September 11th – Confirmation Class is a place where our Jr High students (6th-8th grade) make a transition from child geared Bible stories of Victory Kids towards a more adult understanding of the faith they are living. The Class will meet twice monthly on Sunday mornings during the school year. Currently we will be meeting during the 10:45am service. The first class this year will be on September 11th. Classes will be taught by Pastor Bill Limmer and Jon Brown-Schmidt. The lessons are presented in a 3-year revolving curriculum, so regardless of when a student joins, they receive the entire instruction. If you have any questions or would like to enroll your child, please contact Pastor Bill or Jon Brown-Schmidt. Staff Meeting Cookout (Update) – Every 4th Thursday of the month, I meet with our staff (called, hired, and volunteer team leaders). We pray about our highs and lows, celebrate stories of what God is doing in and through our church, talk through a book to help us grow as leaders, and evaluate what we can do better especially as far as our Sunday experience. This past Thursday we had a cookout on our new church Weber grill and we welcomed Pastor Bill and Peter to the team! Breakfast and Bible Group – No class next Monday for Labor Day (September 5th). Will resume on September 12th. An Army For Jackson — John and Ashley Poulos’ son Jackson (age 4) is currently undergoing treatment for cancer. Please continue to pray for this family! If you would like to help in a tangible way, you can purchase food/grocery/gas gift cards and place them in the box marked “Support for Poulos Family” in the welcome area at church. A GoFundMe page has also been set up online where you can donate. You can also sign up to bring a meal to the family through Care Calendar. To sign up, go to www.carecalendar.org. The Calendar ID is 237748, and the security code is 4799. Any dates that have “Dinner” in red are open for you to bring a meal! Due to a nut allergy in the family, please be sure to prepare all meals nut-free. Any questions? Feel free also to email Sammi Goodger. Fall Women’s Retreat – A one day Women’s Retreat filled with worship, prayer and God’s Word designed to renew and strengthen your faith. Learn how to count trials and sufferings as joy. We will hear how this is possible through God’s promises and learn how we can keep joy in our hearts every day. Saturday, October 8, 2016 at Divine Peace Lutheran Church (3203 S. 76th St. – Milwaukee). For more information and registration visit their event page.